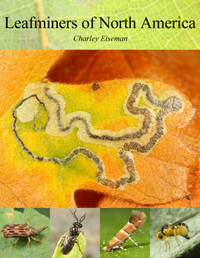 It’s been quiet here on the BugTracks front lately, as I’ve been devoting all of my computer time to working on the leafminer book. As a result, I’ve decided to take a break from “monthly mysteries” for the winter, since all the mysteries I’ve been puzzling over lately are related to my research, and I don’t want to try my faithful readers’ patience by posting one unidentified leaf mine after another. Instead, I’m going to devote one post a month to taking a walk and challenging myself to get some decent photos of bugs that are out and about despite the cold and snow. 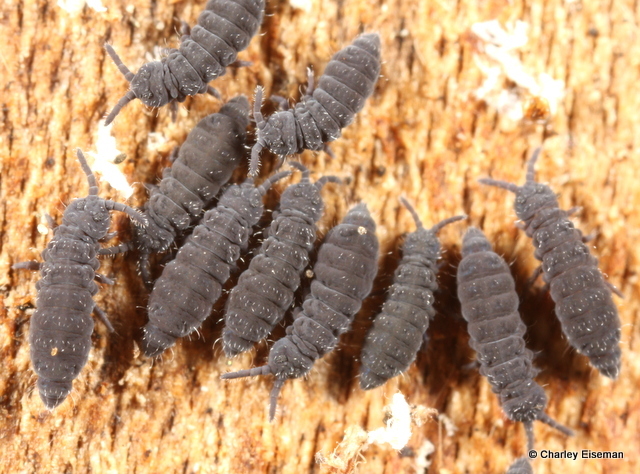 …but on closer inspection there were some other, better camouflaged springtails (Entomobryidae) running around as well. The stripey ones are Entomobrya clitellaria. The plain (second) one is E. griseoolivata. A few inches away, I peeled back another bark flap to reveal a pair of crab spiders (Philodromidae, or “running” crab spiders). Apparently they weren’t hungry for snow fleas. Another bark flap on a different sapling yielded a different type of crab spider (another philodromid, or “running” crab spider.). Heading back toward my house, I saw a winter crane fly (Trichoceridae: Trichocera) alight on the snow long enough to get its picture taken. 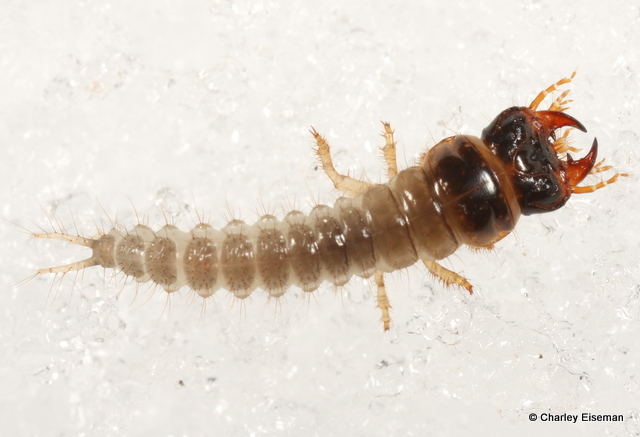 …as well as this ground beetle larva (Carabidae: Harpalini), which might be a little intimidating if it were more than 1 cm long. I’m hoping that by the end of the winter I’ll have photos of one of those wingless crane flies that walks around on the snow. 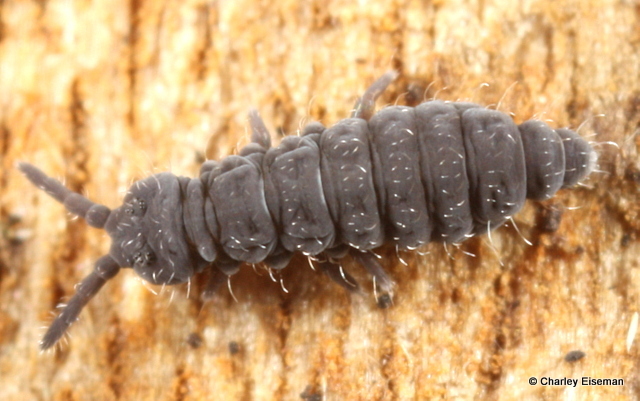 So far the only ones I’ve met since I’ve had a proper macro lens have been missing legs and not very photogenic. 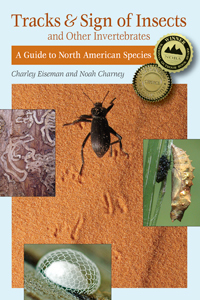 This entry was posted in Uncategorized and tagged beetle, Carabidae, Coleoptera, Collembola, crab spider, crane fly, Diptera, elongate-bodied springtail, Entomobrya, Entomobrya clitellaria, Entomobrya griseoolivata, Entomobryidae, Harpalini, Heleomyzidae, Hypogastrura, Hypogastruridae, larva, Orbellia, Philodromidae, Philodromus, spider, springtail, Trichocera, Trichoceridae, winter crane fly. Bookmark the permalink. You make all that you photograph come to life with such personality and beauty. Thank you for opening my eyes in a new way to the insect world. Nice photos! Just wanted to let you know that those spiders weren’t true crab spiders (Thomisidae), but “running crab spiders” (Philodromidae). Look like the genus Philodromus too. Anyway, thanks for the post! Just the kind of post I like: informative and entertaining! Fantastic photos. Don’t you love how macro photos reveal so much more than your eye originally spotted?